What is so crazy about the cellphone policy is who it does not affect: students at the white specialized/gifted/honors schools and programs. My kids went to Stuyvesant, La Guardia HS For The Performing Arts and NEST+M. All of these institutions had a cellphone policy which allowed all students to carry cellphones in their backpacks or bookbags. Yet students at Wadleigh HS, mostly minority, were given body searches and any cellphones found were confiscated. Discrimination? Disparate treatment? That's what it looks like to me. New York City prohibits students from carrying cellphones in public schools, but many are reluctant to leave their phones behind. As a result, the rule has created a modest side business for shops near some schools that allow students to store their phones for a fee. But along one commercial stretch in Queens that is close to a cluster of schools, storing cellphones has become almost a matter of economic survival. Not only do the merchants reap a small but welcome source of income, but they have also come to rely on the ancillary sales of food and drinks they make to the students dropping off their phones in the morning and picking them up in the afternoon. “It helps me keep my business going,” said Ali Ahmed, 59, the longtime owner of a candy store near the intersection of Hillside Avenue and Parsons Boulevard, where waves of teenagers flow through every school day, headed to and from one of several nearby schools, including Hillcrest and Jamaica High Schools. The phone storage business has transformed the storefront economy around the bustling intersection, producing such a strong business incentive that local owners say they must take part in order to avoid losing foot traffic. Mr. Ahmed said he started storing cellphones against his will. Like many of the merchants who store phones, he said he would prefer to avoid the headache of organizing storage, dealing with rambunctious teenagers and assuming the risk of losing phones or having them stolen. So out of necessity, he joined a half-dozen or so nearby stores and began providing shelf space to local students in Briarwood, a working-class, immigrant neighborhood in Queens where one is hard-pressed to find a teenager without a smartphone. “Nobody wants to leave their phone at home, so we leave them here,” Chitra Deodat, 17, a senior at Hillcrest, said as she picked up her phone from Hill Top Grocery Store on Parsons Boulevard, which is a stone’s throw from Mr. Ahmed’s shop. The competition among the neighborhood merchants has become so fierce that the daily storage rate has dropped to 50 cents a day, from $1. Mr. Ahmed, following other stores’ leads, made a pile of claim tickets by cutting empty cigarette cartons into small squares and then numbering them. He now takes in about 30 phones a day, he said, which has resulted in a rush of afternoon customers buying snacks and sodas, accompanied by groups of friends who also buy items. 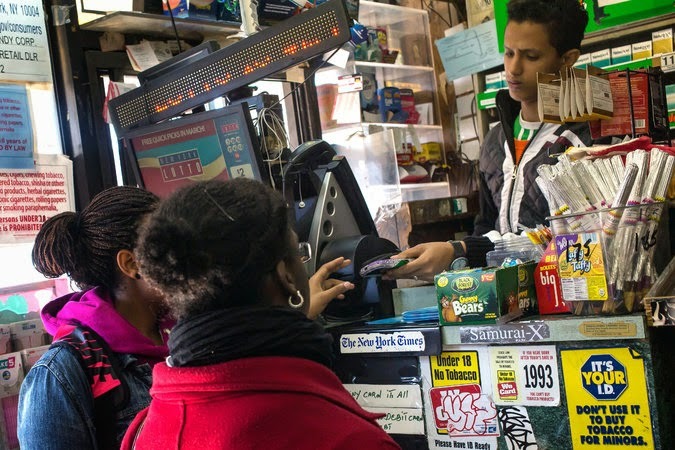 “If they don’t come here, they’ll go over there,” Mr. Ahmed said, pointing toward Sunshine Grocery, a small store across Parsons Boulevard that also stores phones. At Sunshine, Mohammed Mia, who works behind the counter, said he stored several dozen phones a day. As he spoke, groups of teenagers crowded the counter, holding out bright green numbered tickets to claim phones that had been tucked into individual plastic bags, each with a numbered tag inside. Even a local florist, Hillside Floral Design, now stores phones, in the hope that the teenagers will keep the shop in mind when buying party balloons or floral bouquets, the manager, Carlos Fernandez, said. With several stores to choose from, local students said they try to pick the most secure location. Nearly every teenager can rattle off details of the storied tale of a bunch of cellphones belonging to students that were taken during an armed robbery at Hill Top Grocery. “That was two years ago, before I got here,” the afternoon counter man at Hill Top said on Tuesday, adding that no robberies had occurred since. He declined to give his name. It certainly has not hurt Hill Top’s clientele. On some afternoons, the line to pick up phones stretches down the block, with police officers on hand to maintain order. Of the two dozen or so teenagers interviewed in the area, nearly every one of them dismissed the notion of leaving their smartphone at home. The reasons for needing their phones with them included reaching parents, socializing and arranging rides home after athletic practices or work. Most local store owners say they also advise students that they are not responsible for stolen phones. There have been instances, students and merchants said, of claim tickets falling into the wrong hands and phones being picked up by strangers. That is one reason students lauded the owner of Student’s Variety for taking down their names, asking for identification and refusing to release phones to anyone claiming to have a friendship with the actual owner. A dishonest customer did enter Mr. Ahmed’s business recently, claiming a $700 phone that belonged to someone else. New York City students may soon be able to use their cell phones in school, as a majority of the New York City mayoral candidates recently vowed to end Mayor Michael Bloomberg’s cell phone ban inside public schools. In a forum on the future of technology Friday, most mayoral candidates -- including City Council Speaker Christine Quinn, former City Comptroller William Thompson, City Comptroller John Liu, Public Advocate Bill de Blasio, former Bronx Borough President Adolfo Carrion Jr. and former Council Member Sal Albanese -- all said they wanted to reverse the policy. During the "Start Up City" forum, which was organized by Manhattan Borough President Scott M. Stringer and moderated by Buzzfeed Editor Ben Smith, candidates were asked if they would support lifting the ban. "I mean you don't want it on in the classroom and distracting from education and what's going on there," Thompson said, according to Capital New York. "But you want students to be able to bring their phones to school. It's a safety issue." Communication devices, such as beepers, were banned inside New York City classrooms during the late 1980s, according to CBS. The ban was not strictly implemented until 2006, when Bloomberg stepped up enforcement with surprise checks, the Wall Street Journal reports. While parents have criticized the policy, Bloomberg has refused to drop the ban, saying cell phones provide unnecessary distractions in school and help facilitate cheating, CBS notes. According to the New York Post notes, however, at least one mayoral candidate agrees with Bloomberg's cell phone ban. “Whether its cyberbullying or ‘Angry Birds,’ students have enough distractions and teachers have enough challenges in the classroom,” George McDonald said, according to the Post. After the panel, de Blasio asked reporters "How on Earth are parents going to monitor" and "keep on top of their kids if their kids don't have cell phones?" according to Capital New York. He stated that Bloomberg was ignoring “parent rights,” according to the outlet.